A great way to convert your vehicle into a complete camping unit. Easy set up! Just raise the rear window, lower the tailgate and place the tent over the opening. 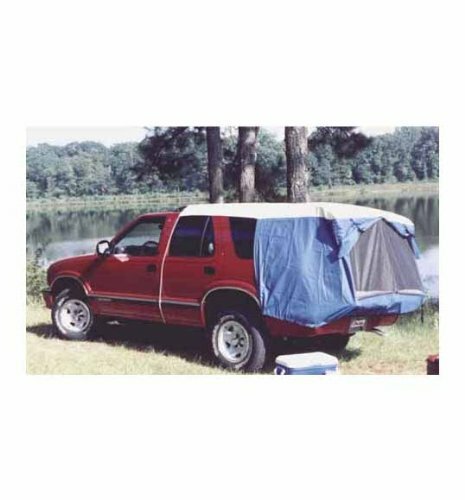 Elastic shockcords with plastic coated hooks snug the tent tight against the truck body by hooking into the underframe and wheel wells . Features great ventilation with 2 no-see-um mesh windows behind the doors.Outer door panels fold up and tie back for maximum ventilation or zip and tie at bottom corners for privacy..Inverted 'T' layout on no-see-um screens and 2 way zippers provide easy entry to the rear of the vehicle..No-see-um screening provides excellent ventilation and visibility..Carry bag included..Roof and walls are coated poyester..Color - Tan roof, Blue walls..Packed Size - 11""x11""x6""..Weight - 5 lbs..Fire retardant..Import.. Fits vehicles with a rear window that raises up and out, and a tailgate LESS THAN 58 inches wide. Fits over carrier rack or air foil. Does not fit vehicles with an external rear mounted spare tire. Easy set up - shockcord with plastic coated hooks attach to the wheel well and the shockcords hold the tent snug to the truck. If you have any questions about this product by Dac Inc.-Vehicle Tents, contact us by completing and submitting the form below. If you are looking for a specif part number, please include it with your message.